Happy Monday lovelies, another week started and I don't know about you but I'm really excited about each week coming because that means, I'm closer and closer to the day when I will pack my suitcases and flight to the city where I was born , grew up, where my closest people live , where my childhood memory is. Even though, still five more weeks left, I already started shopping and as you can see, "Only high heels are permitted" __ just kidding. The truth is that when I was fixing my closet, I realized, I had bought only high heels shoes for my trip to my home city. I don't know whether I just missed wearing them or the environment I will be in, forced me to buy only high heels ( you may remember I talked about my style change after I moved to USA, if you missed that post, you can read it __ Here). I'm thinking to take some comfy shoes and a pair of sneakers with me as well. I'm not sure I will wear them over there, though (LoL). I hope, you all had a wonderful weekend and great start of the week. Well, at least they look like a great selection of high heels. Hopefully they are all comfortable too. Love the chunky heel, perfect for the fall chic styles! Haha! I love high heels too, Nina and I have been waring them again the past few months. My boy is a little older so I don't have to carry him all the time and I can chase after him in heels. LOL! Such a gorgeous collection!!! Happy Monday! All those shoes look great! I especially like the silver ones in the middle. Hope your trip back is fun! Those boots look great. Have a safe trip and thanks for stopping by my blog! Awesome shoes collection! 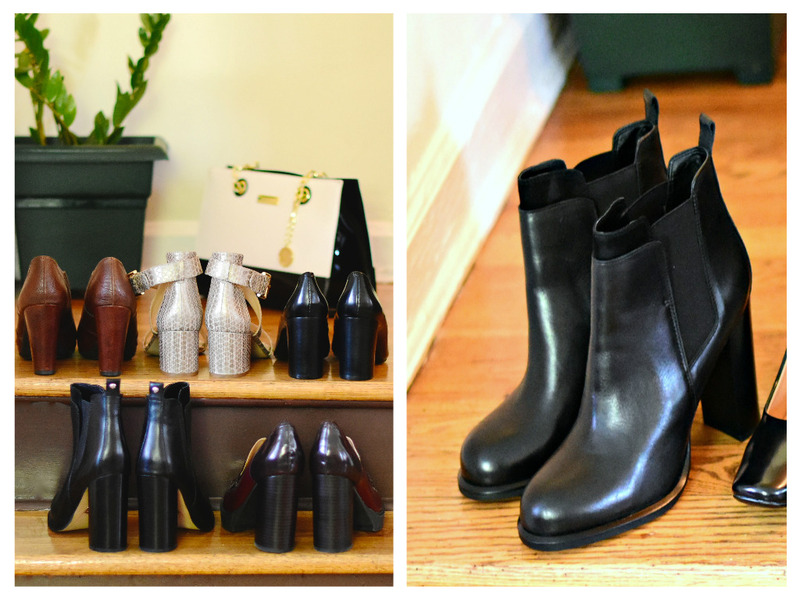 I'm in love with ankle boots for fall, nice classic pairs! I love heels, I would wear the everyday! Love all of those heels! I love those booties dear!!! They're awesome! All of them are high quality and classy! Those ankle boots are definitely great for any kind of weather - so chic, Nina! Loving all these shoes...the heels are so pretty! Lovely shoes! I always like to pack a mix of comfy and fun shoes for a trip. Awesome post! Love all these shoes. Your heels all look pretty comfortable but you might want to bring a pair of flats or sneakers just in case. You are so organized that you are already packing. I feel like I am always waiting until a few days before. I should start earlier as you do. I like your picked and I think you will do fine taking those comfy pairs with you:). awesome shoe buys! so fun for fall! This post is making me envious! All my heels are in storage. I can see the box at the back, but would have to crowd surf over everything else to get to them. I wish I had them in my closet right now. Heels are everything. Those boots are seriously BOOTIful! Wow, the boots are amazing! Sono molto belli questi stivaletti! You got some pretty nice pairs, girlie! I always prefer heels over flats, too :) I hope you have an amazing day, beauty! Looks like you got some really nice pairs! Where are you from originally? Oh, I totally understand you why you can't wait to visit your home city! Btw, I love your collection of shoes, Nina! Those black booties are gorgeous!! Love your collection of shoes. What a pretty collection of heels. OMG those boots are just perfect! Lovely shoes! Cool post! I will definitely read the one about your style change after moving to the USA as well. Atleast it's a nice collection of high heeled shoes and boots. Love the boots especially. Maria // www.phentastic.com | A Lifestyle Blog.